Jeri Southern (vocal) Unknown orchestra directed and conducted by Gus Levene. 10.Isn’t This A Lovely Day? Jeri Southern(vocals), with unknown brass, horns and strings, conducted by Lennie Hayton. Born Genevieve Lilian Hering in rural Nebraska in 1926, and later to adopt the stage name Jeri Southern, ‘Southern’ studied classical piano from the age of six until her early twenties; she apparently played Debussy in private for the rest of her life. She discovered an interest in jazz in the 1940s and was soon playing in clubs as a pianist / accompanist of singers. Before long she began to sing herself and soon made more of a reputation as a singer than as a pianist. She was signed by Decca in 1951 and made several albums, attracting a good deal of favourable attention and having a number of top 30 hits. Though I don’t wish to get into the intractable issue of quite what makes someone a jazz singer, it is worth saying that if one’s idea of jazz singing derives from, say, Ella Fitzgerald, Sarah Vaughan or Anita O’Day, then Southern won’t initially sound much like a jazz singer. Compared to those three she has a small voice of no great range; nor does she display very much in the way of emotional range and certainly lacks the inventiveness of any of those three or, in her different way, Billie Holiday. She never scats; though she can ‘do’ a certain kind of humour; for the most part she sings ‘torch’ songs full of wistful unhappiness. Still, as a singer she was admired by Frank Sinatra and Nat King Cole is said to have liked her piano playing a good deal (I have to say it often sounds rather four-square to me). Her best recordings command one’s attention in the closeness of her focus and the intimacy of her implied relationship with the listener; paying her that attention one begins to hear, some of the time, personal inflections that belong to jazz rather than to the popular singing of the 1950s (which was Southern’s heyday, problems with severe stage fright prompting her to retire from public performance early in the 1960s). Avid have recently issued a package of 4 of her albums from the 1950s – two (The Southern Style and Prelude to A Kiss) originally recorded for Decca and two (Southern Breeze and Coffee, Cigarettes & Memories) for Roulette. Given her shyness and her small voice – her delivery often seems to be a kind of slightly heightened speech – Southern is not, I think, generally heard at her best against a heavily orchestrated background, when the weight of sound and the sophistication of the arrangements can seem seriously at odds with her own musical personality. 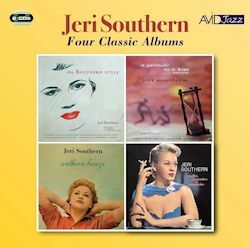 Indeed, my favourite Southern album is a non-commercial recording of a 1956 club date, on which she sings at the piano, accompanied only by bass and drums (Jeri Southern, Blue Note, Chicago, March 1956, UPTOWN UP CD 27.84). The intimacy suits her voice and style in ways that the elaborate (over? )production of many of her commercial recordings doesn’t. Of the four albums in this AVID reissue, The Southern Style is the only one where Southern performs with a small group. ‘One Day I Wrote …’ and ‘I’ll Wear the Green Willow’ are characteristic – but better than average – Southern laments of love’s pains; but she also tackles, with success, some more up-tempo (and emotionally upbeat) songs like ‘Let’s Fall In Love’ and ‘It’s De-Lovely’. In the first of these her work at the piano is worthy of attention. A Prelude to A Kiss, with a larger orchestra in accompaniment, begins with Ellington’s ‘Prelude to a Kiss’ and ends with Ray Noble’s ‘The Touch of Your Lips’ (the Kiss enjoyed), with songs such as ‘I Don’t Want to Walk Without You’, ‘Please Be Kind’ and ‘Hold Me’ in between, thus creating an implied narrative. It’s all well-planned, but the arrangements are a little too glib (particularly in their use of the strings) and Southern’s voice has to be given a certain artificial prominence in the balance. Rarely has her voice sounded more silk-like, but there is a sameness to most of the proceedings and there isn’t a lot on this album to appeal to the lover of jazz. Things are rather different on Southern Breeze, where Southern’s accompaniment comes from a band led by Marty Paich and featuring a goodly number of West Coast jazz musicians. Paich’s beautifully judged arrangements complement Southern perfectly; in their restraint they allow Southern to phrase in ways that are true to her own instincts. In some cases (e.g. ‘Who Wants To fall In Love’) the ‘bounce’ the band provides prevents Southern lapsing into the excessive introspection which sometimes overtakes her. The jazzmen don’t get the chance to play extended solos, but they contribute (notably Auld and Fagerquist, who is strangely listed as playing trombone in Avid’s booklet) some attractive fillers. What is particularly striking on this album is how perceptive Southern’s treatment of lyrics is. So, for example, she relishes Yip Harburg’s witty lyrics in ‘Down With Love’, as much as she caresses Harold Arlen’s melody. Southern sings ‘Lazy Bones’ in a perfectly laid-back manner. This track also benefits from some fine work by tuba-player John Kitzmiller (who played string bass on a number of Southern’s recordings). The whole album, while never challenging or innovative, is a delight. If one listens straight through the second CD in this set, tracks 13-24 come as something of an anticlimax. Of the four albums reissued here, Coffee, Cigarettes & Memories is the only one I hadn’t heard before. Seeing that the musical director was Lennie Hayton, I had some reasonable hopes of it, since Hayton certainly understood jazz. He worked, in his youth, with musicians such as Beiderbecke, Joe Venuti and Eddie Lang. Being married to Lena Horne (his second wife) surely added further to his understanding of the jazz idiom. However, there is little sign of Hayton’s jazz side on this album. The ‘torch’ song has largely taken over and Hayton’s over large accompaniment sometimes comes close to swamping Southern. Perhaps by the time of this album Hayton had spent too long working for MGM in the Hollywood studios. The intelligence with which Southern interprets lyrics survives, but little else of what was best about her work does. A shame that this 2CD set should end like this, because, especially on The Southern Style andSouthern Breeze there is a good deal to enjoy here .